In Real Life Photos, News, and Videos | Just Jared Jr. 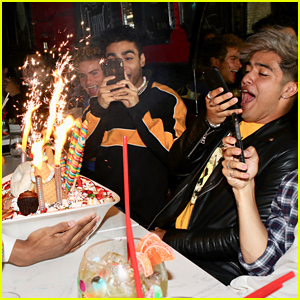 In Real Life completely lost it over this dessert during their visit to Sugar Factory in New York City on Wednesday afternoon (April 24). The guys – Brady Tutton, Chance Perez, Drew Ramos, Sergio Calderon, and Michael Conor – stopped by the eatery for a little break during their press tour. In Real Life are currently promoting their latest single, “Crazy AF”. In fact, they just dropped the official music video earlier this month – check it out on JJJ now! The guys – Brady Tutton, Chance Perez, Drew Ramos, Sergio Calderon, and Michael Conor, aka the final five vocalists from Boy Band – shared the fun visual with fans on Thursday (April 4). Watch it all go down below! You can also download “Crazy AF” on iTunes. Nia Sioux rocks a colorful dress while arriving at the 2019 iHeartRadio Music Awards on Thursday (March 14) at the Microsoft Theater in Los Angeles. The 17-year-old singer was joined on the red carpet by Teala Dunn, Witney Carson, Jake T. Austin and boy band, In Real Life. Witney shared her starstruck moments she had at the show on Twitter. Check out her other tweets below! had the best time tonight at @iHeartRadio awards! got to see the amazing @nickcarter and @backstreetboys do their thing! best performance of the night! also john legends shoulder brushed my shoulder…. so..,, there’s that. Dinah Jane hangs out with Noah Cyrus inside at Variety’s 2018 Power of Young Hollywood held at Sunset Tower Hotel on Tuesday night (August 28) in West Hollywood, Calif. The two musicians were seen dancing together and enjoying the party, which celebrates actors, actresses, directors, musicians and artists under the age of 25 who have made an impact in the business this year. Boy bands In Real Life (Sergio Calderon, Michael Conor, Chance Perez, Drew Ramos and Brady Tutton), and PRETTYMUCH (Austin Porter, Brandon Arreaga, Edwin Honoret, Nick Mara, and Zion Kuwonu) were also seen inside the party.